WOW. The Nordstrom Half Yearly Sale is so good. 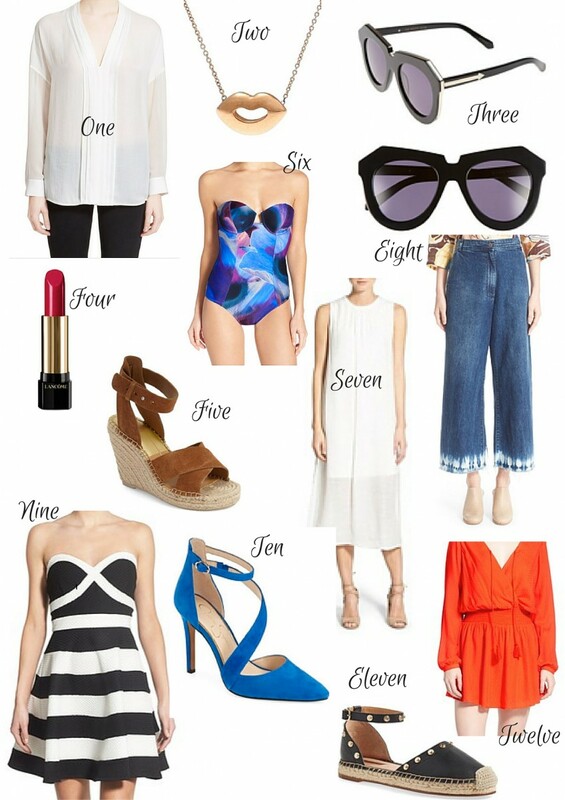 I’m really excited about the items I’ve picked out in this guide; they’re all summer essentials. I tried my best to select items that are classics that can be in style for many summers to come. One, Two, Three, Five, and Twelve have me giddy. One, a Vince top, is a staple that I think can go year round and be lightweight for summer days and nights. I also know that Vince tops are high quality and will last me for quite a while. And then for two, I mean…it’s lips and I’ll feel like I’ll be wearing my blog logo wherever I go! Then there’s THREE. I died. I’ve been coveting others’ Karen Walker sunglasses lately and I have to make this pair my own. Five and Twelve are already an outfit in the making! Throw in some turquoise earrings and then we’re talkin’. Six, Seven, Four, and Eleven scream summer to me. Six: This strapless one piece swimsuit is definitely worth it; the colors and pattern can almost be considered a neutral because it’s not too bold of a pattern. I picked this white midi dress with the sheer overlay because it has a modern shape with a modern edge that can easily be the base with a leather jacket in the fall and a lightweight bomber right now. Flat espadrilles (Eleven) can never be a waste of money for a summer staple. These add an edge with the studding and are guaranteed to be comfortable for lots of walking! And this sale wouldn’t be complete without me featuring a lipstick, of course. The Lancome ‘L’Absolu’ Rouge will be a creamy lip love, and the formula has an ingredient that will leave your lips feeling plump and hydrated. Last but not least, Eight, Nine, and Ten are giving off quite a cool girl vibe. The striped strapless dress is definitely something I’m interested in because it’s fit & flare! Fit & flare or A-line fits are great for those with more hourglass or curvier figures. It accentuates the waist and doesn’t add any extra unwanted volume to the hip area! The dress would also go great with the Jessica Simpson turquoise pump. Wedding attire, anyone? These shoes are elegant and can be a classic, but there’s added interest with the strap that cascades across the foot. They also come in other colors like black or neutral that can definitely keep you going on many a wedding dance floor! I’ve been dying over other bloggers in their crop flare jeans, and I’ve been on the hunt for a pair! And this pair couldn’t be any cooler. The dyed hem adds a ton of dimension to any outfit!